This is the perfect breakfast for the morning after the night before! A bit of carbs, protein and a kick from the Bloody Mary sauce will have you back on track in no time. That is if you’re not to hungover to cook at all! The pancake mix will make about 6 small pancakes so you choose how much of the topping you want per person. Put all of your Bloody Mary Sauce ingredients in a pan and gently simmer. To make your pancakes firstly separate your eggs. Then sift the flour, baking powder, salt and sugar in to a bowl. Whisk the egg whites until they form soft peaks. Drop your egg yolks in to the flour and whisk then slowly add in the milk until smooth. Take 1 tbs of the egg whites then mix in. Then gently fold in the rest of the egg until the mixture is light and almost foamy. Set aside while you prepare the toppings. In a sauce pan add a couple of tablespoons of white wine vinegar then boil your kettle and fill the pan 3/4 of the way up. Turn the hob on to a gentle heat. Take the duck egg and lower in to the water for about 30 seconds. Take it out then using a spoon stir the water so you get a whirlpool in the middle of the water. Crack the egg as close to the water as possible then drop in. Leave to simmer for about 3 minutes. You can lift the egg with a spatular and if it seems a little runny just lower it back in. Take out of the water and place straight in to cold water to stop the cooking. Keep the boiling water on the simmer to re-heat the egg before you serve. Grill your bacon to just how you like it then take 3 pieces of black pudding and fry for a couple of minutes each side. Finely chop a little chorizo and fry in the pan until slightly crispy. Pop it all on a plate to keep warm in the oven on a low setting. Lightly oil a pan on a medium heat then using a ladle gently pour in the pancake mix. Once you notice the bubbles appearing on the batter mix gently slide the spatular under and flip over the pancake. Cook until nice and golden. Drop your egg back in to the hot water for a minute to warm back up then its time to assemble. 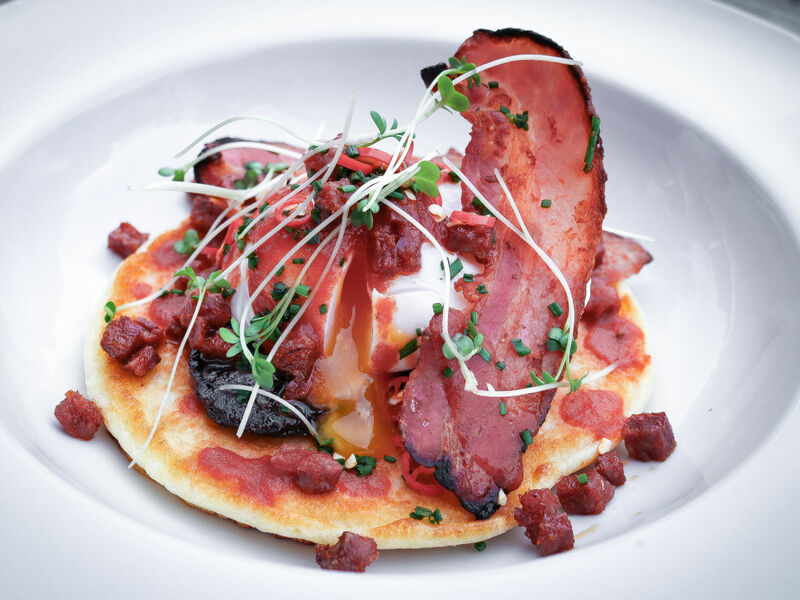 Place the pancake on the bottom then the black pudding, Arrange the bacon around the egg then top the egg with the chorizo. Pour over a couple of tablespoons of the Bloody Mary sauce then garnish with the chives and cress! Hope you feel better soon…. Enjoy!